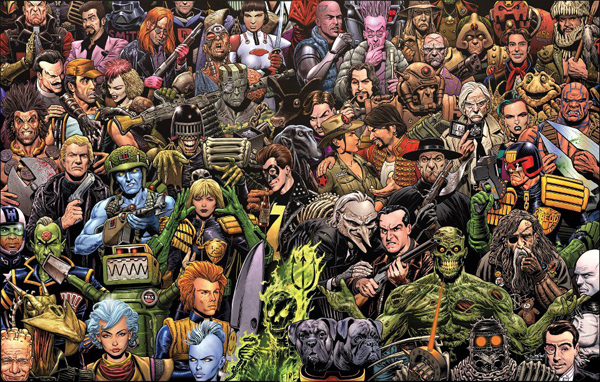 British comics staple 2000AD is 39 this week. I wasn’t even born when the first issue of 2000AD arrived back in 1977 costing the sum of 8p in Earth money but I like many other British kids soon discovered the thrill power of 2000AD. Personally as much as I like X-Men and Batman comics have never really been about superheroes for me, maybe it’s the distinction between growing up in Britain and the U.S, depending on your age comics were either the knockabout charm of The Beano and The Dandy (which were phenomenally popular back in the day) or the distinctly more edgy 2000AD. 2000AD wasn’t about heroes with powers rescuing people or kids getting up to mischievous hi-jinks, it was about imaginative and sometimes nightmarish dystopian sci-fi, brutal and harrowing war stories and fantastical adventures usually with an anti-authoritarian spirit and often with themes that were far more adult than anything else available to British kids at the time. As the excellent book Thrill-Power Overload and the recent documentary Future Shock! The Story of 2000AD demonstrate 2000AD would become a national treasure to British comics fans with its fan base spreading overseas. As much as the likes of Jerry Siegel, Joe Shuster, Bill Finger, Bob Kane, Stan Lee and Jack Kirby are credited for their work in laying the foundations for the American comics you see today (I think Walter Gibson’s The Shadow is criminally overlooked in this aspect personally) 2000AD’s John Wagner and Pat Mills are fundamentally important to British comics. 2000AD’s most famous character Judge Dredd would go on to be just one character in a vast dystopian sci-fi universe which inspired two films (although we don’t really talk about one of them) with Judge Andersen, The Dark Judges, The Angel Gang, Chopper, Jack Point and P.J Maybe just being a handful of characters that inhabit the dark but blackly comical future which would become so popular it got its own publication in the form of the still on-going Judge Dredd Megazine in 1990. There’s more to 2000AD than Judge Dredd though, Slaine, would filter a Conan style fantasy through Celtic mythology, A.B.C Warriors, the story of a team of robot soldiers built for a brutal war, Strontium Dog, the adventures of Johnny Alpha a mutant (no not like the X-Men) bounty hunter in the irradiated wasteland of the future, Rogue Trooper, the harrowing tale of a betrayed genetically engineered soldier in a hellish war of attrition burning with vengeance and plenty more besides. So here’s to more years of 2000AD and more zarjaz stories blowing people’s minds.